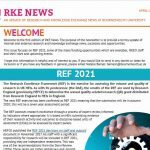 The latest issue of RKE News is now available. 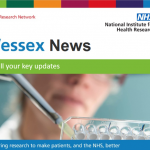 The purpose of the newsletter is to provide a termly update of internal and external research and knowledge exchange news, successes and opportunities. 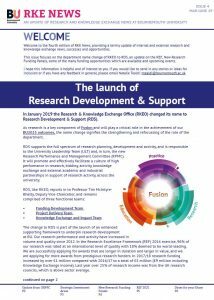 This issue is packed full of hopefully useful information including the launch of ‘Research Development & Support’, our new Research Funding Panels, REF 2021, some of the many funding opportunities which are available and upcoming events. I hope this information is helpful and of interest to you. If you would like to send in any stories or ideas for inclusion or if you have any feedback in general, please let me know.